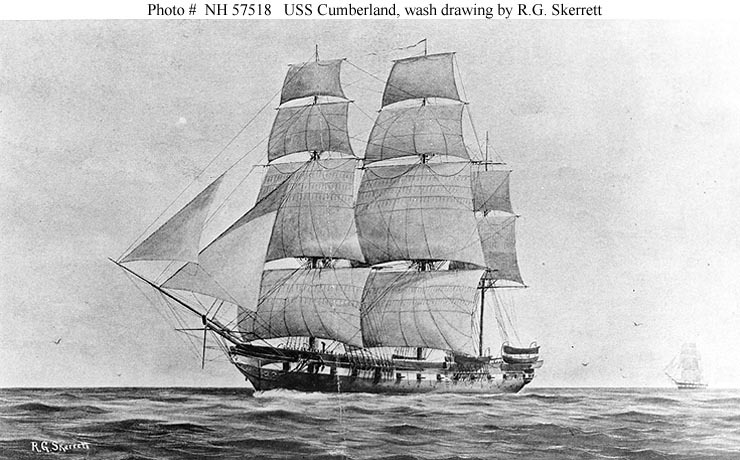 USS Cumberland, a 1,726-ton sailing frigate, was built between 1825 and 1843 at the Boston Navy Yard. She was commissioned in November 1843 and served for the next few years in the Mediterranean. She was in the Home Squadron in 1846-48, sometimes as its flagship, and participated in Mexican War operations during this time. Cumberland made two more deployments to the Mediterranean in 1849-51 and in 1852-55. In 1855-56, Cumberland was converted to a sloop of war, allowing her to carry a battery of heavier, though fewer, guns. She was flagship of the Africa Squadron in 1857-59 and was again flagship of the Home Squadron in 1860. As the secession crisis turned warlike in the spring of 1861, Cumberland was at the Norfolk Navy Yard, Virginia, and was towed to safety when that facility was burned and abandoned on 20 April. Thereafter, she served on Civil War blockading duty off the Confederacy's Atlantic coast, taking part in, among other things, the capture of Forts Hatteras and Clark in late August 1861. Cumberland was anchored off Newport News, Virginia, on 8 March 1862, when the ironclad CSS Virginia came out to attack Federal warships in Hampton Roads. In a battle that decisively demonstrated the power of the armored steam-powered warships against the earlier wooden sailing types, Cumberland was rammed and sunk by the Virginia (CSS Virginia destroys USS Cumberland and USS Congress). Her own guns were unable to significantly hinder the Confederate ironclad, and she was incapable of sailing away from the encounter.